Jay Chapman is the Founder, President and Chief Executive Officer of Capstone Building Corporation. 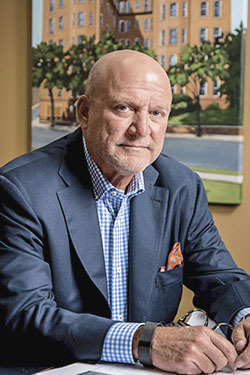 Under his exemplary direction, Capstone Building Corp. has become a leading general contractor in the multifamily industry with successfully completed projects from coast to coast. Capstone Building Corp. concentrates on a comprehensive range of projects including multifamily developments, luxury dwellings, senior living facilities, government housing entities and student housing across the United States. Over the last 20 years, Capstone Building Corp. has completed projects in 22 states totaling over 1.3 billion dollars. As President and CEO of this nationwide company, Jay Chapman serves not only as the customer advocate, but his “hands-on” management style brings tremendous value and insight to his clients. Jay has learned every aspect of the construction industry through careful company interaction with over 30 years of experience in the construction industry. Jay also acts as a liaison to the customer and he ensures that every project is built to exceed expectations. Jay realizes his commitment to each project is only as crucial as the employees on the job. He makes certain that his employees are equipped with the knowledge, plans, and tools needed to complete each project successfully. Jay is an active member in the industry and currently serves as a member of the Associated Builders and Contractors, Inc. of Alabama, the United States Green Building Council (USGBC), and the Association of College and University Housing Officers International (ACUHOI). He is a member of the Birmingham Rotary Club and holds a Merchant Marine / U.S. Coast Guard Captains’ license for 100-ton vessels. He also serves on the Advisory Council for the Tigers Unlimited Foundation at Auburn University. Jay holds the general contractor state licenses for Alabama, Arizona, California, Connecticut, Florida, Idaho, Illinois, Louisiana, Mississippi, North Carolina, Oregon, South Carolina, Tennessee, Virginia, and Washington.